I am also in the process of setting up a 1-wire network of Dallas Semiconductor Temperature sensing iButtons to provide fine sensing of environmental parameters around the house. Eventually, this will be connected to a few TINI Java web servers plugged in to some of the network points around the house. Initially, I am practicing with the Thermochron iButton (DS1921) interfacing to a DS9097U-009 1-Wire COM Port Adapter and a DS1402D-DR8 Blue Dot iButton Receptor, as well as extending the wiring of the 1-wire network around the house and fitting sensors such as DS1820 temperature sensors and DS2405 switches. The initial components - a DS1402D-DR8 iButton Receptor, 2 DS9097U COM port adaptors, 3 DS1921 Thermochron iButtons, 2 DS2405 switches and 4 DS1820 temperature sensors. The plan is then to move on to start with 1 TINI Java web server to test and build up experience with, then acquire a second unit, so one TINI can be used for upstairs and one TINI used for downstairs, both connected to the Home Area Network (HAN). The principal purpose of setting up the iButton network is for temperature monitoring with a finer level of resolution and easier accessibility via computer than with a standard heating/climate control system. The sensors used to achieve this are Dallas Semiconductor DS1820 digital temperature sensors - lots of them. The advantage of using small temperature sensors such as these, and especially on a 1-wire network, is it becomes relatively easy to turn a house from a static structure into a structure with rudimentary embedded sensing of its environment. Once the temperature monitoring aspect has been established, the data gathered can then be used to determine thermal energy requirements for each room. Heating control systems could then be interfaced to a computer with more detailed control over each room's thermal energy requirements, to provide more energy efficient heating, and through sensors fitted in the roof, to measure heat loss through the roof. By adding DS2405 switches wherever there is a door or window relay sensor for security, it should also be possible to track where bulk heat loss is occurring both internally and externally. Adding a 1-wire weather station enables a house to detect when it is raining too, and in conjunction with the DS2405 switches, to alert the owner if any windows or doors have been left open if it is raining - none of this is "rocket science", it can be done now, it just needs careful planning .....very careful planning. Example of a 1-wire network to measure temperature within a house, and heat loss, using DS1820 Digital Thermometer devices and DS2405 Digital Switches. 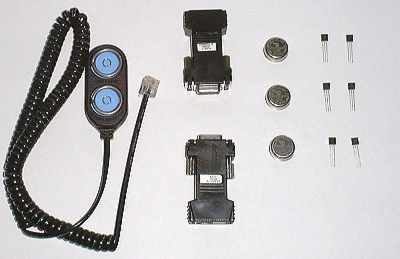 A number of these sensors are available as part of the 1-wire weather station. Example of a 1-wire network using DS1820 Digital Thermometer devices. Probably the hardest part of setting up a 1-wire network is not writing software, but obtaining the hardware! Dallas Semiconductor (the manufacturer of the iButtons and 1-wire sensors) seem to operate on a delivery timescale that has more in common with geological epochs than weeks or months. Generally, long after you order and give up any hope of ever receiving your goods, they will turn up. Having said that, with Dallas Semiconductor having been taken over by Maxim, I've now noticed a marked improvement in delivery timescales compared with before. The ibutton.com website provides 1-wire software which can be freely downloaded for use with 1-wire networks, running in conjunction with PCs using Windows operating systems. The software, TMEX, is easy to install, and easy to operate. You need to ensure that you have a 1-wire network set up in order for the software to work, but this can consist of no more than a 1-wire serial adaptor, a cable to the 1-wire device, and the 1-wire device itself. The Misterhouse Perl home automation software also includes code to read data from iButtons on a 1-wire network, thus providing similar capability on Linux and UNIX platforms.